Ailyn Perez and Stephen Costello Photo: Robert Millard/LAO 2012. Sometimes its hard for those of us who love opera to the point of obsession to remember that its an art form like any other. And one of the things opera shares with other art forms is that it is an expansive and diverse practice that encompasses more things than it may be possible for one person to love, admire, or find challenging. You and I both may love films and know a great deal about them. But that doesn’t mean we love the same films, and we may not go to the movies for the same reason or even to see the same things. People who love opera tend to think of the art form as a much smaller world with shared interests in the same rarities and love of many similar works as other opera lovers. They love to read about new productions of Verdi and Wagner operas and talk about specific challenging roles. They assume that all opera lovers share their interests despite disagreements about this singer or that production. But when it comes right down to it they, and that’s a they I would include myself in, are often wrong. Opera is as big an art form as any other and peoples’ interests in it are varied and they come to it with wildly different expectations and desires as they would painting or sculpture or anything else. This is where the quandary of Puccini’s La Bohème comes into the picture. People who see a lot of opera, and people who write about opera, often dread it. They dread it even if they like it, because it is so familiar and omnipresent in the opera world. No matter how good the cast is, or how good the direction is, its familiarity often makes it a challenge to see the show and finding anything exciting or new about it. Negative La Bohème reviews by opera critics are easy to come by, especially for productions that have seen multiple revivals over the years. And yet, the show is a favorite for opera company’s because first and foremost it sells tickets. People want to see this opera and it fulfills many of the desires that certain opera goers have about what they want from the art form. It doesn’t matter what critics write, the tickets sell anyway just like a summer action movie that does incredible business despite a consensus of negative critical reaction. La Bohème, regardless of a production’s overall quality, represents what a lot of people want from opera. In Los Angeles Opera’s current run of Puccini’s classic, these audiences are getting what they want. The second performance on Saturday was sold out, as are many of the shows in the run. The audience members around me that afternoon couldn’t have been more thrilled by the show. People wept openly as Mimi died at the end. Granted my reaction to the show was not anywhere near so strong, but I can’t deny that the show makes people happy, even through their tears, and that my feelings about it don’t matter a hill of beans to them. LAO’s production is in its sixth revival of a 1993 show directed by film legend Herbert Ross who was responsible for such movies as The Turning Point, California Suite, and The Goodbye Girl. He died many years ago, the current director to bring his staging to life is Gregory A. Fortner. The show looks surprisingly well kept for its operatic age, the cinematic scope of Ross' original can still pack a punch at times. The typical way one goes about sprucing up an older production is to hire a fresh young cast. LAO has done that many times before with Ross’ show over the years and does so this time as well. The Rodolfo and Mimi are real-life husband and wife and Richard Tucker Award winners Stephen Costello and Ailyn Perez. They look the part of young lovers and give strong worthwhile performances. Costello’s career continues to expand with progressively bigger assignments and his athletic tone is attractive and certain. Perez has had her share of attention as well and though I was less taken with her on Saturday, she was well matched with her husband and has definite stage presence. But vocally I was most impressed with LAO Domingo-Thornton Young Artist and recent Metropolitan Opera National Council Auditions winner Janai Brugger who is singing Musetta in the first three performances of the run. The energy skyrocketed when she walked on stage and she gave one of those performances where you think, yes, I remember there are in fact all of those notes in this part. Her technique was beautiful and her sense of comic timing superb. She promises to be a thrilling artist to watch and I hope LAO can find more for her to sing in their regular productions very soon. Artur Rucinski sang Marcello with strength and personality as well. In the pit, Houston Grand Opera music director Patrick Summers was making his company debut. He led an energetic performance overall, though he did indulge some of the vocalists a bit more than was necessary dragging out some passages to the verge of tedium. But these details probably only matter so much to many in the audience who came to relive a tragic love story set in the most romanticized version of Paris. And for those who wanted to fall in love or have their hearts broken, even if vicariously through the players on stage, it was a successful evening. And if you share their interests, I imagine you will to. 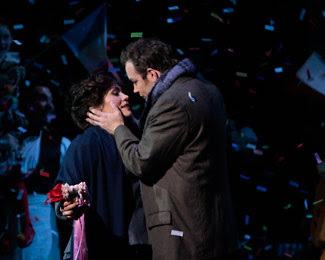 La Bohème runs downtown for four more performances through June 2. You're being very kind and wise about different audiences having different needs and expectations from opera. Being a jaded old thing myself, after many decades attending the San Francisco Opera, I just don't bother going to "La Boheme" or "Tosca" or just about any Puccini anymore if I can help it. Same for "Faust" and a few others. In compensation, I do tend to go to the Janacek and Britten productions more than once to make up for those people who would hate every second of it.